This masterpiece of Christian literature by a 16th-century priest explains how to live a holy life in the secular world. Drawn from the letters of St. Francis de Sales, it presents clear and direct advice about praying, resisting temptation, and maintaining devotion to God. A key figure in France's Counter Reformation, St. Francis de Sales (1567-1622) served as Bishop of Geneva and was canonized in 1665. The popularity of his prolific writings on spirituality led to his nomination as the patron saint of authors and journalists. Today's readers feel a special affinity for St. Francis, whose suggestions for living a truly Christian life don't involve withdrawal from the world. In this enduring spiritual guide, his remarkably modern advice appears in the form of letters. The saint's frank and practical counsel ranges from embracing meditations that strengthen the resolve to maintain a virtuous existence to performing daily exercises that renew the soul. 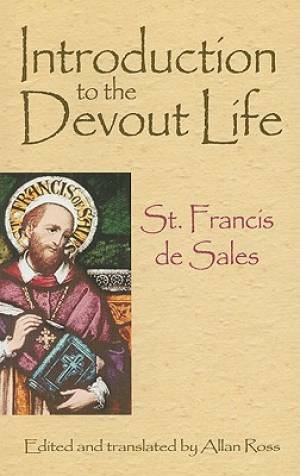 Introduction to the Devout Life by St. Francis de Sales was published by Dover Publications Inc. in March 2009 and is our 33235th best seller. The ISBN for Introduction to the Devout Life is 9780486471686. Be the first to review Introduction to the Devout Life! Got a question? No problem! Just click here to ask us about Introduction to the Devout Life.